My first encounter with maps was in sixth grade social studies class. Our assignment was to shade every country in Europe a different color – a class exercise that went awry when the U.S.S.R. was dissolved and we’d erased our maps so many times that Europe was either missing or took on the glow of a Mark Rothko painting. This was right around the time that the first global positioning system became operational and the census bureau implemented TIGER. This bastion to data nerds assigned a unique position to every road, street address, boundary and waterway in our country – creating a mix-master-map that we all can access. TIGER laid the groundwork for Yahoo, Mapquest, Google Earth, Bing and other web mapping services that were hard to imagine back when maps were drawn on paper and “gaming” meant shooting four-pixel deer on Oregon Trail. My (80s) generation witnessed an entire geospatial revolution from beginning to end, all while burning mixed tapes and coveting Molly Ringwald's job at the record store, and boy does that make me feel dated. So if the words “geographic information system” make you uncomfortable, then this blog is for you. It turns out geospatial maps are free and easy to create, and with a little practice, even those of us who are old enough to remember when Nirvana topped the Billboard charts can use them to tell compelling stories about public health. Over the past few years President Obama has promoted an open government initiative that encourages policymakers to be more transparent and collaborative. The initiative has supported public-private partnerships in building applications that will make government health data more publicly available. This is important because for years, mapping health data has been too expensive and laborious for the average Joe. Thanks to these partnerships, we are seeing more online maps that can be customized with the click of a button – maps rich with information ranging from disease rates (John Snow, maybe the Charles River is a concern) to whether your neighbors are eating their veggies (love my Boston Organics). An oldie-but-goodie is Bing Health Maps, created in 2010 as part of the U.S. Health and Human Services Community Health Data Initiative. The application essentially mashes up HHS health data with Bing maps, allowing us to display dozens of community health indicators by state and county. Using the map is easy: Select a state and health indicator from the drop-downs. Once the map is populated with data and counties are shaded, you can click on any county to view a list of health indicators. Since 2010, HHS has launched health challenges encouraging government and the public sector to work together to improve the health of Americans. The newest challenges include a mobile health application to help consumers visualize health care quality and a web application to enable community use of data on cancer prevention and control. I give a virtual fist bump to President and First Lady Obama for putting community health on the map! 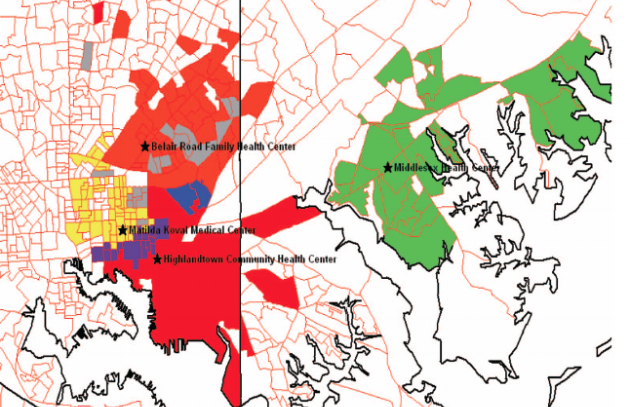 The red shading on the upper map highlights the ideal service area of a Baltimore-area clinic based on the location of medically underserved areas. The orange shading on the lower map, in turn, highlights the actual service area. The juxtaposition of these maps ignited a debate over whether the clinic was meeting the needs of underserved areas – as well as explanations for the previously unrecognized service area range. As the investigators wrote, the maps led stakeholders to "strategize around unrecognized patterns of clinical use, including unexpected use by remote populations." Participatory interpretation of the mapped data was described as essential to understanding why some communities were accessing health services and others were not. "Interaction between administrators, clinicians, and community members allowed the unique knowledge and expertise of each – whether in data, neighborhood geographies, [or] community history – to capture the real power of mapped data." The following is another example of maps serving as centerpieces for community health dialogue. In this case maps were used to identify areas within a transitioning community in Charlotte, NC, with significant health needs. Maps were again created and interpreted using a participatory approach: The investigators developed a research network that "brought together health providers, community members, and researchers with the shared goal of improving community health by increasing access to primary care." To create this map, the research network's community advisory board met to decide which community attributes to take into account when assessing an area's need for primary care. Ultimately the network chose five attributes: socioeconomic status, population density, insurance status, patterns of emergency department use, and primary care safety net. A separate map was created for each attribute, with each census tract shaded according to score. A composite map was then compiled from the separate map layers to show census tracts with the greatest health need. "We were able to provide detailed geographic information indicating where services were required and where their location would probably have the greatest impact," the authors wrote. These examples underscore the importance of a community perspective on health and the power of geographic communication to bring health data alive and make it more accessible. This may be a good point at which to turn the conversation over to you. What are your thoughts on President Obama's "open data" initiative and the potential to make health information more publicly available? 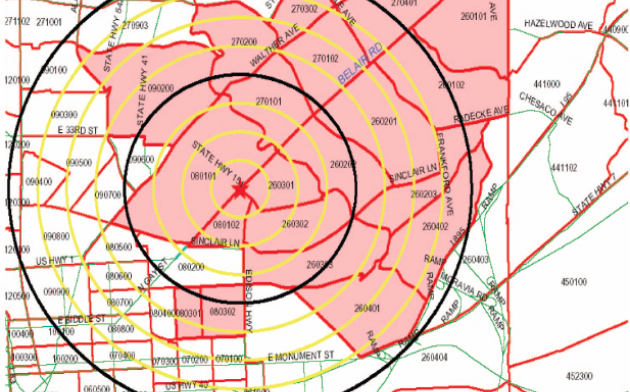 In what other ways are folks using geographic information systems? Please join the conversation – and be sure to share your favorite songs from any mixed tapes you made in the 1990s. Bazemore A, Phillips RL, Miyoshi T. Harnessing geographic information systems to enable community-oriented primary care. Journal of the American Board of Family Medicine 2010; 23(1): 22-31. Dulin MF et al. Geographic information systems demonstrating primary care needs for a transitioning hispanic community. Journal of the American Board of Family Medicine 2010; 23(1): 109-120. Maps were reproduced with written permission from the corresponding authors and journal.